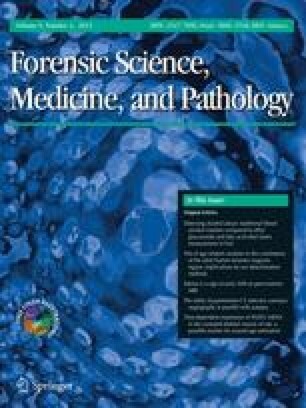 To determine whether crush asphyxia may be associated with macro- and microscopic changes in the thyroid gland, four cases of death due to crush asphyxia were evaluated where the decedents (males aged 36, 37, 45, and 65 years respectively) suffered lethal chest compressions. The diagnosis of crush asphyxia in each case was suggested by the death scene description and confirmed by the finding of injuries to the torso, with marked congestion of the face, neck, and upper body associated with petechial and subconjunctival hemorrhages. In addition to other pathological findings, each decedent had intense congestion of their thyroid gland resulting in a dark/black appearance. Microscopically, stromal capillaries were engorged, with bulging of capillaries into the follicles. Rupture of these small vessels had created focal intrafollicular aggregates of erythrocytes within the colloid. As intense suffusion of the thyroid gland with blood in cases of crush asphyxia may impart an appearance of “black thyroid” this may be another feature of this condition to look for at autopsy, in addition to intrafollicular blood lakes on histology.